A while ago I noticed that it isn't possible create smart automations if you haven't way provide control data for scripts. After lot of thinking and discuss with my colleagues I noticed that it would be useful have SQL database which contains all control data and all the scripts can read them from there. On this blog post, I will explain how you can create simple server provision database and script which will automatically create new virtual machines using control data on database. 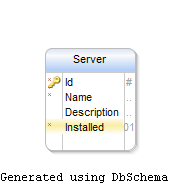 I used DbSchema for generating this database schema. It's trial works 15 days with all features which is enough for generating this kind test databases. Here is picture of DB and SQL script for create it. Following functions can be used for communicating with SQL server. You can just copy / paste them to PowerShell. Connect-ControlDB -SQLInstance "SQLserver" -Database "ServerProvision" -SQLuser "SQLuser" -SQLPwd "SQLpwd"
New-VMSchedule -VMName "testserver1" -VMDescription "First provision test"
Then you would have example this kind script scheduled on Hyper-V server (of course you need include functions for above to it). Script reads scheduled installations from SQL, deploy them and mark ready.